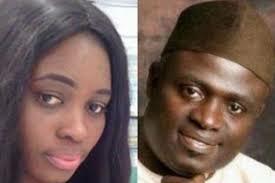 A federal lawmaker and Pension Ad Hoc Committee Chairman’s daughter, Deborah Ighiwiyisi Agbonayinma has been working with the National Pension Commission (PenCom) with fake foreign and local university degree certificates, The Nation has learnt. Deborah’s father is Ehionzuwa Johnson Agbonayinma, the member representing Egor/Ikpoba-Okha of Edo State in the House of Representatives. A source at the National Assembly, who pleaded anonymity, said Deborah Agbonayinma was sacked about four weeks ago. She worked at the commission for three years. The source said Miss Agbonayinma worked in other government agency with the fake certificates before joining PenCom. In a telephone conversation with The Nation, Agbonayinma who spoke on his Committee’s probe of Pension Fund Administrators, declined comment on the allegations against his daughter. Miss Agbonayinma’s curriculum vitae with which she was employed in PenCom stated that she obtained a B.Sc degree in Accountancy with certificate number 12129 on August 8, 2012, from Irish University Business School located on 219 Bow Road, London E3 2SJ. A verification committee at PenCom, however, found that no such university existed as a valid UK degree-awarding institution. Having learnt that her foreign degree was ‘fake’, Miss Agbonayinma brought another degree in Accountancy to the Commission as a replacement from Olabisi Onabanjo University, which the university also disclaimed as fake. The Olabisi Olabanjo University (OOU), in Ogun State, in a letter dated February 6, 2019, and signed by the University’s Principal Assistant Registrar in charge of Exams and Records, Mrs O. L. Kaka, told PenCom that Miss Agbonayinma’s academic records and transcripts were fake. The CV also showed that she served as an Accountant in the Ministry of Finance, Budget and Economic Development in Edo State during her Student’s Industrial Work Experience Scheme (Scheme) from June 2008 to November 2008 one year after she was enrolled to study Accountancy in London in 2007.